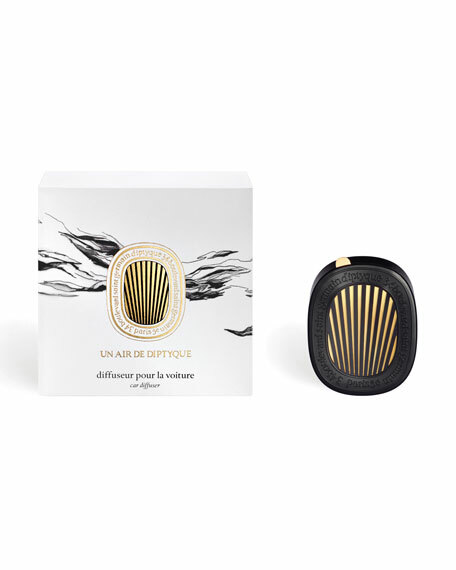 Diptyque's novel car diffuser is artistic and sophisticated and uses an innovative system of cold diffusion. Simply attach to the car ventilation to start a cycle. Thanks to the movement of the metal grid, it is possible to adjust the intensity of the fragrance to your preference. Open the diffuser housing to insert the scented cartridge. Attach the diffuser to the ventilation of the vehicle. Adjust the grid according to the desired fragrance intensity. Cartridges sold separately from the diffuser (only compatible with the Diptyque electric cartridges). Dimensions: height: 7.5 cm / width: 5 cm / depth: 2 cm.